ALL MAKEUP DONE BY ME. I had a makeup blog called fanzcy.blogspot.com which I changed to MarixelFanzcy.blogspot.com last 2008. I also had a youtube account called MarixelFanzcy in which I uploaded videos of me babbling about makeup and such, doing random haulage and suggesting all kinds of cosmetics that work out and that I personally like. I was having so much problem with the blog itself, editing, deleting, adding etc, that I easily got tired of it. It's really too bad since I already had about 100 plus followers and my youtube account had 700 plus subscribers. It was a lot of fun and very time consuming. Having said that I "had" meaning I don't have that blog anymore nor do I still have a youtube account. I've deleted all of them since I think fashion is more me. It didn't even last a year tsk tsk. I still get inspired by anything means of art. I can still do makeup and I still love all kinds of cosmetics. Heck I still buy a lot of makeup junk, I have so many blushes and lipstick to last me a lifetime. I thought I'd post two favourite pics of mine. Makeup to me is like an art, a painting, only your painting on your face. I always say that makeup and fashion are supposed to be fun, there are no rules, just enjoy and be creative. Makeup is suppose to enhance your natural beauty, of course you don't want to be seen looking like a clown, insert-my-pic above. 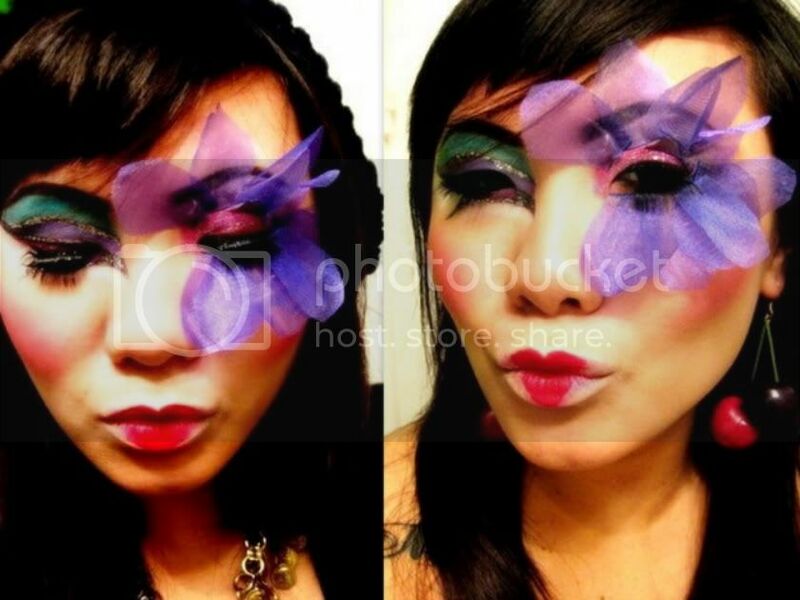 I did that look for a makeup contest, just for fun, it turned out rather artsy. Let me know if you like it. If I feel inspired to go crazy on makeup, I will for sure post another look, but for now I will fashion-away.